While many organizations achieve acceptable ROI from their CRM/SFA implementations, a number of published surveys have revealed alarmingly high failure rates. 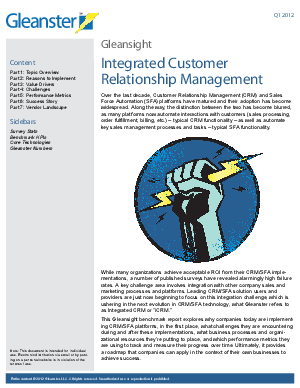 A key challenge area involves lack of integration with other company sales and marketing processes and platforms. Leading CRM/SFA solution users and providers are just now beginning to focus on this integration challenge, which is ushering in the next evolution in CRM/SFA technology, what Gleanster refers to as Integrated CRM or "iCRM." This Gleansight benchmark report explores why companies today are implementing CRM/SFA platforms and how they augment these platforms with lead management and sales automation capabilities.